The Hopi heirloom seed corn is harvested throughout September. The sweet corn is steamed in a pit and then dried to be used in ceremonials throughout the year. A thrifty people, they believe in extending the harvest and not just eating up the seasonal abundance. Most of the corn is dried and then later ground for use in cooking. The blue and red cornmeal is the main staple for cooking. The white is rough ground for using to make prayer offerings and also finer ground to make a traditional pudding which is baked underground and offered at weddings, ceremonies and other traditional gatherings. The men and boys grow the corn, tending it as if it is their children, even singing to it. Prayer is part of the process. Once they harvest the corn, it becomes the property of the lady of house to process, store and prepare. Social Dances such as butterfly or dances honoring other tribes (Navajo, Havasupai) are also performed. They are joyful non-Kachina celebrations primarily performed by young men and women. They are also a thanksgiving for the blessings of the season. The youth do these dances in the plaza and also each school at Hopi has Indian Day where these are performed and the families bring traditional food to share. In this way the youth grow up participating in the Hopi cycle of the year. The three women’s ceremonies celebrating maturity and fruition and sets the stage to begin again with germination. Maraw Women’s Ceremonials consecrate the harvest season. Initiated adult women participate in the fall ceremonials in the kivas and with public dances. Lakon and Owaqlt–the Women’s Basket Dances are prayers for healthy fertility. The ladies spend several days in a kiva to fast, pray, and chant and prepare. When the women emerge from the kiva, they chant while presenting baskets to the four directions of the compass, lifting them, then lowering them. Their movements are designed to bring cold, wet weather so that the crops will grow the following spring. 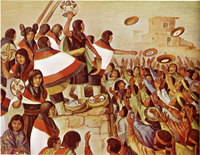 Afterward, the women traditionally toss the baskets to the onlookers. These baskets are greatly prized by the men, who will literally tackle each other to obtain one. Our main fund raising time is in December and then we go up Jan. 11, 2014 to deliver food, clothing, learning games, sports items, household supplies and toiletries for Hopi families as part of our main winter gifting project. Last year we were able to extend this to more people. This support in dead of winter is always a breathe of joy for our Hopi friends. We are working with the teachers to provide needed classroom supplies. And with the special needs coordinator to supply winter clothing for the most needy kids. We are seeking interested shoppers who would specifically buy a sweatsuit, socks, gloves, and puffy jacket for one or more of these kids. For the last 2 years, these kids have been thrilled to received this. $450 project to help two traditional familes repair badly leaking roofs. The ladies of these households are right now in the kivas at Second Mesa participating in a series of women’s ceremonials and have to worry about the moonsoon rains leaking in. Would you like to be on our project mailing list? Only a few newsletters a year with photos, cultural articles and current events. We never share our list with anyone.